Our precious little girl is now 2 months old! She is getting to be too much fun! The best part about her getting bigger is that she is now sleeping through the night! We are now on week 2 of at least 8 hours a night. It is so heavenly! She's also taking some awesome naps throughout the day. We're really trying hard with getting on a schedule and it seems to be working. She gets up around 8am and is all smiles. I put her in bed with us in the morning and crack up at her smiles, giggles and sassy-ness. Way too much fun!! Kate had her 2 month appointment yesterday that was filled was shots. She did really well but is still fighting a little temperature. So sad! We are so thankful for our baby girl and could not be more in love! OMG Nikki, Kate is just too cute!! 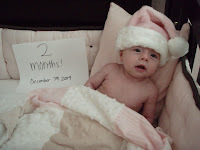 I can't believe she is 2 months already....I know how fast time flies by:) Hope you are enjoying every minute with her.